Taiwan: whose narrative has not been told? Did you know that Taiwan has been home to Austronasian-speaking indigenous peoples for thousands of years? In the 19th century, these 16 tribes lost their sovereignty and now live under the shadow of the dominant culture. Professor Steinmetz visited Taiwan for four months last year to learn more about the story of the indigenous peoples of Taiwan, including interviewing several leaders of the indigenous people. She found the indigenous tribes to be resilient and unified, with a strong ethnic identity. They are united by their history of struggle and hardship, but also by the adoption of Christianity. This conversion has helped them cope with the acculturation process under both Japanese and Chinese authority. 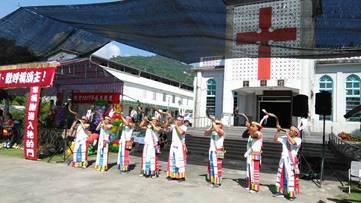 The majority of these tribes confess Christianity as their religion, in contrast with four percent of the general Taiwanese population. Professor Steinmetz’s research was supported by a Taiwan Fellowship grant from the Ministry of Foreign Affairs, Republic of China. Admission is FREE. However, to help us better prepare, we ask you to register that you plan to attend. Click here, then click again on Sign Up. To receive email confirmation, you must provide your email address. Your email address will not be shared with others. Thank you.